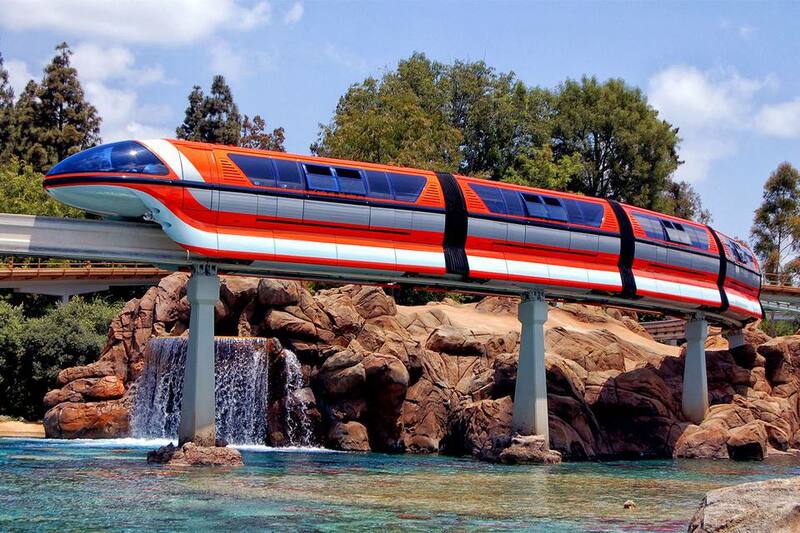 The Disneyland Monorail first appeared in 1959, when it became America's first single-rail transportation system. But don't let that confuse you into thinking it will take you everywhere in the Disneyland Resort area. At Disneyland in California, you can take the monorail to get from place to place, but its route is limited. Think of it more like a ride than a part of the transit system. The Disneyland Monorail only has two stops, in Tomorrowland and in Downtown Disney, where there is a Disneyland entrance. The Tomorrowland station is above the Finding Nemo ride between Autopia and Tomorrowland Terrace. The monorail passes through California Adventure and the Grand California hotel, but you can't board in either of those places. You can't take it to the Disneyland Hotel, either - although you could do that years ago before the hotel moved. The Downtown Disney stop is just a short walk from today's Disneyland Hotel. This what you'll see along the monorail route (roughly), starting from the Tomorrowland Station: First you'll pass the Disneyland Railroad and Harbor Boulevard on the edge of the park. In California Adventure, it passes the Monsters Inc ride, goes over the California Adventure entrance and passes through the Grand Californian Hotel. After making a sharp right turn, it stops at Downtown Disney. After that, it goes back to Disneyland and makes a few turns and bends before reaching the Tomorrowland Station. The Disney monorail travels a 2.5-mile loop. It takes it 20 minutes to go all the way around the park. It's a good way to rest your feet or to get into or out of the park from Tomorrowland without having to walk all the way to the front gate. Before the Disney Monorail train arrives, talk to the cast member on the platform. If there's space up front and you're quick to ask, you might get a chance to ride with the driver. Don't be shy or slow about this or you'll lose your opportunity. No food or drinks are allowed aboard the Disney Monorail. The Disney Monorail stops running about an hour before the fireworks begin and starts again as soon as Tinkerbelle has cleared the airspace (which is about 45 minutes after they're over) with the last trip 30 minutes before closing time. You can get right onto the Disney Monorail in your wheelchair or ECV. One car on each train is built to accommodate wheelchairs and ECVs. Just ask a Cast Member for help. In Tomorrowland, go to the elevator next to the Winner's Circle near Autopia. It will take you up to the Disney Monorail platform. When it opened in 1959, the Disney Monorail was America's first single-rail transportation system. Then Vice-President Richard Nixon was among its first riders. So the story goes, Walt Disney was so excited about the new monorail that he grabbed Nixon, and they jumped on board for a ride, leaving Nixon's Secret Service agents standing bewildered at the station. The Disney Monorail uses Mark VII model cars introduced in 2008. According to the Disneyland website: "Computer monitored, the fleet is operated and controlled at a speed of approximately 30 mph by onboard pilots. And because the Disneyland Monorail uses a 600-volt DC power source, the trains do not emit exhaust or pollutants." That distinctive, deep-throated woot-woot you hear when the monorail passes comes from a Grover 1056 horn. It sounds when the monorail leaves a station when it approaches the Matterhorn when a bird lands on the track and to greet passing Disneyland Railroad trains. Disney tried to market the monorail system as a clean method of public transportation but they only sold one short-track version to the Houston International Airport. Is It Different than the Monorail in Florida? Yes! In Florida, you use the monorail to get around the resort. In California, it’s more like a ride with boarding in Downtown Disney and Tomorrowland only.